I think one of the unexpected outcomes of the web/comic marriage is how the national habit of reading comics turned out to be so paper-bound. 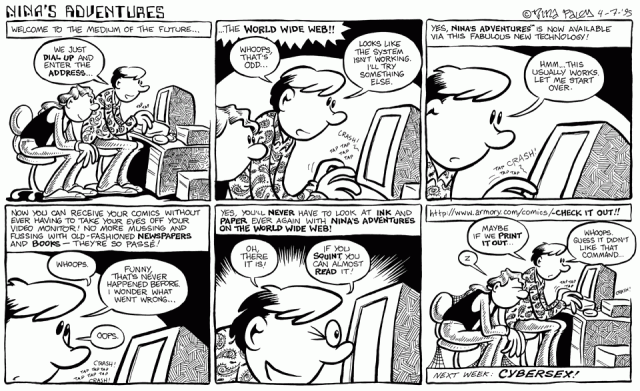 Web comics DO exist, and many are doing well online. But there’s this certain detachment from comics among the mass populace that seems to be increasing alongside the public’s detachment from newspapers in general. Comics created following by their easy regular exposure whenever someone looked over the sport scores or headline news in general, all from one place. Now that people absorb newspapers much less consistently, these followings and familiarities are tough to build up. I open a newspaper every couple of months and, now, each time I check the comic section it seems to have a new slew of comics that I don’t recognize. And of those shining stars I do, (Dilbert, Doonesbury – personal examples), I rarely find myself tracking down their “daily dose” counterparts online. After all, it’s not like I check out one web place each day, either. So it’s really tough I think to make it online with a web comic even though I remain positive that eventually something will come up to restore that relationship. Pretty much all the comics I read these days I read online. And most of them are not published in newspapers. Newspapers as a delivery system for comics come up short in just about any comparison to their online cousins. Newspaper comics are small, hard to read with simplified artwork (anything too intricate is not going to be readable at that size) and most of all generally boring. The ones that aren’t I can read online as well.